Have you ever wondered what it would be like to look in on your family after your death, and possibly impact how they are living their lives? 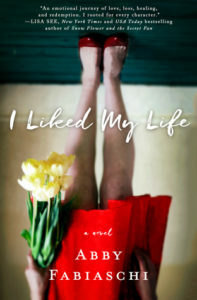 In Abby Fabiaschi’s novel I Liked My Life, Maddy Starling, the fortysomething mom of a teenage girl, Eve, died after jumping from the roof of a college library where she volunteered. Eve and Maddy’s husband, Brady, are left to pick up the pieces of their shattered lives after Maddy’s death. They each remember Maddy as a devoted mother and wife who seemed happy and fulfilled. How could she have taken her life, leaving them bereft and stuck with each other when she had always been the glue of the family? As Eve and Brady try to make sense of what happened and learn how to relate to each other, they also try to understand Maddy better. They read her journal in hopes of identifying the source of her unhappiness, and they examine their own behavior toward her, which was at times self-centered and selfish. They regret how they treated Maddy and wish they could rewind and pay more attention to her and her needs. Meanwhile, Maddy is floating around, trying to influence their behavior and cure their problems. She prompts them to say and do certain things by repeating those words to them as they go about their day. She also plays matchmaker, finding a woman who ends up serving as Eve’s math tutor and a possible love interest for Brady. So while she’s gone from their lives, she’s still orchestrating things behind the scenes. I Liked My Life is an interior novel, in that most of what happens takes place in the characters’ heads. Fabiaschi is expert in analyzing relationships and identifying their pressure points. Maddy is a pretty amazing mother, but her relationships with Brady and Eve go through normal ups and downs. Fabiaschi clearly gets modern relationships, and it shows. I Liked My Life is neither super-depressing nor gauzy women’s fiction (despite the cover). It is substantive and moving, at times very sad and at times funny. I found it to be a slow read, mostly because it’s dense and detailed. This is not a book to skim, because you might miss something good. The ending is pretty satisfying, particularly the “Ten Years Later” chapter. If you’re up for a mostly sad book where not a lot happens but you can really get to know the characters and understand their relationships, I Liked My Life is for you. Posted on March 25, 2018 by gayle. This entry was posted in Fiction and tagged abby fabiaschi, i liked my life. Bookmark the permalink. I loved this book as well, but it didn’t get much buzz. And you are exactly right, despite the soft cover and the initial event, it is not light reading. It was just the right balance of introspection and tension. Great review! I just finished this book and really, really liked it. I both read and listened to it, and thought both the narrative and the narration were excellent. I found the epilogue a little too neat and tidy, but that was my only very mild criticism. A very thought provoking, deep read.